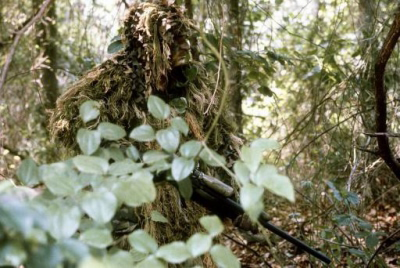 A U.S. Marine sniper wearing sniper camouflage gear known as a "ghillie" suit advances through a forest during a training exercise. View a larger image. Ghillie suits exploit a camouflage strategy called cryptic camouflage. Cryptic camouflage is one of the four basic strategies of deception by camouflage. In cryptic camouflage, the deceiver succeeds by blending into the environment so as to deceive the perceiver. Targets can deceive bullies in this way by mimicking other elements of the workplace environment so as to convince the bully that the target is not engaged in counterattack development or counterattack execution. Adopting temporarily the characteristics of a terrorized target can accomplish this. Examples of behaviors that convey this message are withdrawal, absenteeism, and subservience. Since all successful camouflage is designed to match a specific perceiver, targets attempting to use cryptic camouflage should choose approaches that are most likely to deceive their specific bullies. Photo courtesy U.S. Department of Defense. Observation is the first O of the OODA acronym (Observe, Orient, Decide, Act). Last time, we examined some general properties of counter-bullying strategies, focusing on the inner state of the target and the nature of effective counterattacks. But counterattacks can be much more effective when based on a clear understanding of the entire situation, and that requires accurate information about the bully, the organization, and the legal environment in the relevant jurisdiction. And that's where Observation becomes important. Here are some tactics and strategies for targets, emphasizing situational awareness. Targets have an edge if they have a thorough understanding of the bully's history, behavior, and plans. Also valuable are the stances and actions (or often, the inactions) of bystanders, other targets, the bully's supervisor, the target's own supervisor, and the HR department. When formulating counterattacks, it all helps. Targets can attack the bully in many domains: at work, in the local community, in the professional community, in court — whatever works, within the law. That's why it's helpful for targets to know their legal rights, what's needed for legal action, and how to gather evidence. The legal route isn't easy, but it's a route nonetheless. Targets can also work to degrade the bully's own situational awareness. They can accomplish this by neutralizing the bully's resources, or by using those resources to confuse the bully. For instance, many targets, or their allies, telegraph to bullies that they "aren't going to take it anymore." Revealing this change in stance is counter-productive. Targets who have allies can impress upon them the importance of depriving the bully of any information about the target's intentions or state of mind. Targets can deliver disinformation to the bully, directly or indirectly, keeping in mind that effective disinformation requires knowing the truth well enough to create plausible deceptions. See "Biological Mimicry and Workplace Bullying," Point Lookout for March 31, 2010, for an example. Even better: build relationships with allies of the bully. Converting a bully's ally to a target's ally, or to a neutral, can help to degrade the bully's overall situational information quality. vulnerabilities inadvertentlyengaging in counterattacks can sometimes expose their own vulnerabilities inadvertently. For instance, a counterattack in the domain of the professional community might motivate the bully to do something similar, or to mount an attack in the domain of the local community. Targets should carefully assess their own vulnerabilities in any domain in which the bully might mount an attack. Upon discovering a vulnerability, targets would do well to take steps to remove it or conceal it, and to conceal any indications of its prior existence. Would you like to see your comments posted here? rbrenTWySTWnuyGVSzkrNner@ChaciSmbykZBPBoVLhrKoCanyon.comSend me your comments by email, or by Web form. I offer email and telephone coaching at both corporate and individual rates. Contact Rick for details at rbrenlIfUWPtUhpoituPJner@ChacqGGIhFokzwXxajnXoCanyon.com or (650) 787-6475, or toll-free in the continental US at (866) 378-5470.